Exeter Chiefs head coach Rob Baxter says his side must learn from having to play away from home in their European Champions Cup quarter-final. The Devon club topped their pool but three defeats meant a trip to Wasps in the last eight, where they were beaten. "We could've taken control of our pool and we didn't - Wasps took control of their pool," Baxter told BBC Devon. "It was that close a game, and you could probably put it down to the fact that we had to come here." 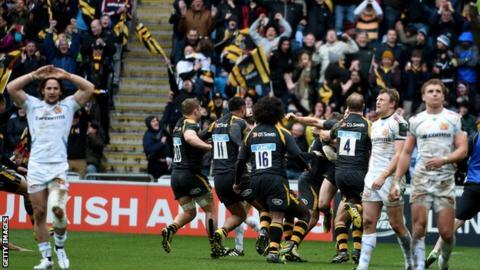 Exeter had led 24-11 at one stage in the second half but a last-gasp Jimmy Gopperth conversion completed a Wasps turnaround at the Ricoh Arena. The quarter-final would have been held at Sandy Park had Rob Baxter's side picked up an extra five points from their pool matches. "We were handed the opportunity by going to Ospreys (in their first pool game) to take control of the pool and we didn't even get a point - that's the thing we need to learn. "That's why we had to come here and ultimately that's probably been the difference in the sides. "We can still make this Premiership season about us, we can still make sure we get a home semi-final and we can start to make some of these big games about Exeter Chiefs," added Baxter. "That's what we can do and that's what I want our reaction to be."